Greetings!! I’m Charlie and I live in Northampton in the UK. The mud guard fell off the bottom of car so instead of fixing it we dutifully left it on the bench in our garden and forgot about it. This is what happened after it snowed in 2009. 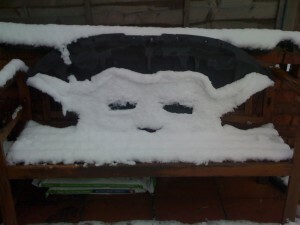 Not Yoda but Snowda !